Most industries produce some wastewater. Recent trends have been to minimize such production or to recycle treated wastewater within the production process. Battery manufacturers specialize in fabricating small devices for electronics and portable equipment (e.g., power tools), or larger, high-powered units for cars, trucks and other motorized vehicles. Pollutants generated at manufacturing plants includes cadmium, chromium, cobalt, copper, cyanide, iron, lead, manganese, mercury, nickel, oil & grease, silver and zinc. The specific pollutants discharged by organic chemical manufacturers vary widely from plant to plant, depending on the types of products manufactured, such as bulk organic chemicals, resins, pesticides, plastics, or synthetic fibers. Some of the organic compounds that may be discharged are benzene, chloroform, napthalene, phenols, toluene and vinyl chloride. Biochemical oxygen demand (BOD), which is a gross measurement of a range of organic pollutants, may be used to gauge the effectiveness of a biological wastewater treatment system, and is used as a regulatory parameter in some discharge permits. Metal pollutant discharges may include chromium, copper, lead, nickel and zinc. Fossil-fuel power stations, particularly coal-fired plants, are a major source of industrial wastewater. Many of these plants discharge wastewater with significant levels of metals such as lead, mercury, cadmium and chromium, as well as arsenic, selenium and nitrogen compounds (nitrates and nitrites). Wastewater streams include flue-gas desulfurization, fly ash, bottom ash and flue gas mercury control. Plants with air pollution controls such as wet scrubbers typically transfer the captured pollutants to the wastewater stream. Ash ponds, a type of surface impoundment, are a widely used treatment technology at coal-fired plants. These ponds use gravity to settle out large particulates (measured as total suspended solids) from power plant wastewater. This technology does not treat dissolved pollutants. Power stations use additional technologies to control pollutants, depending on the particular wastestream in the plant. These include dry ash handling, closed-loop ash recycling, chemical precipitation, biological treatment (such as an activated sludge process), membrane systems, and evaporation-crystallization systems. Technological advancements in ion exchange membranes and electrodialysis systems has enabled high efficiency treatment of flue-gas desulfurization wastewater to meet recent EPA discharge limits. The treatment approach is similar for other highly scaling industrial wastewaters. Wastewater generated from agricultural and food processing operations has distinctive characteristics that set it apart from common municipal wastewater managed by public or private sewage treatment plants throughout the world: it is biodegradable and non-toxic, but has high concentrations of BOD and suspended solids (SS). The constituents of food and agriculture wastewater are often complex to predict, due to the differences in BOD and pH in effluents from vegetable, fruit, and meat products and due to the seasonal nature of food processing and post-harvesting. Processing of food from raw materials requires large volumes of high grade water. Vegetable washing generates waters with high loads of particulate matter and some dissolved organic matter. It may also contain surfactants. Animal slaughter and processing produces very strong organic waste from body fluids, such as blood, and gut contents. Processing food for sale produces wastes generated from cooking which are often rich in plant organic material and may also contain salt, flavourings, colouring material and acids or alkali. Very significant quantities of oil or fats may also be present. Food processing activities such as plant cleaning, material conveying, bottling, and product washing create wastewater. Many food processing facilities require on-site treatment before operational wastewater can be land applied or discharged to a waterway or a sewer system. High suspended solids levels of organic particles increase BOD and can result in significant sewer surcharge fees. Sedimentation, wedgewire screening, or rotating belt filtration (microscreening) are commonly used methods to reduce suspended organic solids loading prior to discharge. The production of iron from its ores involves powerful reduction reactions in blast furnaces. Cooling waters are inevitably contaminated with products especially ammonia and cyanide. Production of coke from coal in coking plants also requires water cooling and the use of water in by-products separation. Contamination of waste streams includes gasification products such as benzene, naphthalene, anthracene, cyanide, ammonia, phenols, cresols together with a range of more complex organic compounds known collectively as polycyclic aromatic hydrocarbons (PAH). The conversion of iron or steel into sheet, wire or rods requires hot and cold mechanical transformation stages frequently employing water as a lubricant and coolant. Contaminants include hydraulic oils, tallow and particulate solids. Final treatment of iron and steel products before onward sale into manufacturing includes pickling in strong mineral acid to remove rust and prepare the surface for tin or chromium plating or for other surface treatments such as galvanisation or painting. The two acids commonly used are hydrochloric acid and sulfuric acid. Wastewaters include acidic rinse waters together with waste acid. Although many plants operate acid recovery plants (particularly those using hydrochloric acid), where the mineral acid is boiled away from the iron salts, there remains a large volume of highly acid ferrous sulfate or ferrous chloride to be disposed of. Many steel industry wastewaters are contaminated by hydraulic oil, also known as soluble oil. Mine wastewater effluent in Peru, with neutralized pH from tailing runoff. The principal waste-waters associated with mines and quarries are slurries of rock particles in water. These arise from rainfall washing exposed surfaces and haul roads and also from rock washing and grading processes. Volumes of water can be very high, especially rainfall related arisings on large sites. Some specialized separation operations, such as coal washing to separate coal from native rock using density gradients, can produce wastewater contaminated by fine particulate haematite and surfactants. Oils and hydraulic oils are also common contaminants. Wastewater from metal mines and ore recovery plants are inevitably contaminated by the minerals present in the native rock formations. Following crushing and extraction of the desirable materials, undesirable materials may enter the wastewater stream. For metal mines, this can include unwanted metals such as zinc and other materials such as arsenic. Extraction of high value metals such as gold and silver may generate slimes containing very fine particles in where physical removal of contaminants becomes particularly difficult. Additionally, the geologic formations that harbour economically valuable metals such as copper and gold very often consist of sulphide-type ores. The processing entails grinding the rock into fine particles and then extracting the desired metal(s), with the leftover rock being known as tailings. These tailings contain a combination of not only undesirable leftover metals, but also sulphide components which eventually form sulphuric acid upon the exposure to air and water that inevitably occurs when the tailings are disposed of in large impoundments. The resulting acid mine drainage, which is often rich in heavy metals (because acids dissolve metals), is one of the many environmental impacts of mining. The waste production from the nuclear and radio-chemicals industry is dealt with as Radioactive waste. Pollutants discharged at petroleum refineries and petrochemical plants include conventional pollutants (BOD, oil and grease, suspended solids), ammonia, chromium, phenols and sulfides. Effluent from the pulp and paper industry is generally high in suspended solids and BOD. Plants that bleach wood pulp for paper making may generate chloroform, dioxins (including 2,3,7,8-TCDD), furans, phenols and chemical oxygen demand (COD). Stand-alone paper mills using imported pulp may only require simple primary treatment, such as sedimentation or dissolved air flotation. Increased BOD or COD loadings, as well as organic pollutants, may require biological treatment such as activated sludge or upflow anaerobic sludge blanket reactors. For mills with high inorganic loadings like salt, tertiary treatments may be required, either general membrane treatments like ultrafiltration or reverse osmosis or treatments to remove specific contaminants, such as nutrients. Textile dyeing plants generate wastewater that contain synthetic and natural dyestuff, gum thickener (guar) and various wetting agents, pH buffers and dye retardants or accelerators. Following treatment with polymer-based flocculants and settling agents, typical monitoring parameters include BOD, COD, color (ADMI), sulfide, oil and grease, phenol, TSS and heavy metals (chromium, zinc, lead, copper). Industrial applications where oil enters the wastewater stream may include vehicle wash bays, workshops, fuel storage depots, transport hubs and power generation. Often the wastewater is discharged into local sewer or trade waste systems and must meet local environmental specifications. Typical contaminants can include solvents, detergents, grit. lubricants and hydrocarbons. Many industries have a need to treat water to obtain very high quality water for demanding purposes such pure chemical synthesis or boiler feed water. Many water treatment produce organic and mineral sludges from filtration and sedimentation. Ion exchange using natural or synthetic resins removes calcium, magnesium and carbonate ions from water, typically replacing them with sodium, chloride, hydroxyl and/or other ions. Regeneration of ion exchange columns with strong acids and alkalis produces a wastewater rich in hardness ions which are readily precipitated out, especially when in admixture with other wastewater constituents. Wood preserving plants generate conventional and toxic pollutants, including arsenic, COD, copper, chromium, abnormally high or low pH, phenols, oil & grease, and suspended solids. Insecticide residues in fleeces are a particular problem in treating waters generated in wool processing. Animal fats may be present in the wastewater, which if not contaminated, can be recovered for the production of tallow or further rendering. The various types of contamination of wastewater require a variety of strategies to remove the contamination. Brine treatment involves removing dissolved salt ions from the waste stream. Although similarities to seawater or brackish water desalination exist, industrial brine treatment may contain unique combinations of dissolved ions, such as hardness ions or other metals, necessitating specific processes and equipment. Brine treatment systems are typically optimized to either reduce the volume of the final discharge for more economic disposal (as disposal costs are often based on volume) or maximize the recovery of fresh water or salts. Brine treatment systems may also be optimized to reduce electricity consumption, chemical usage, or physical footprint. Brine treatment is commonly encountered when treating cooling tower blowdown, produced water from steam assisted gravity drainage (SAGD), produced water from natural gas extraction such as coal seam gas, frac flowback water, acid mine or acid rock drainage, reverse osmosis reject, chlor-alkali wastewater, pulp and paper mill effluent, and waste streams from food and beverage processing. Brine treatment technologies may include: membrane filtration processes, such as reverse osmosis; ion exchange processes such as electrodialysis or weak acid cation exchange; or evaporation processes, such as brine concentrators and crystallizers employing mechanical vapour recompression and steam. Reverse osmosis may not be viable for brine treatment, due to the potential for fouling caused by hardness salts or organic contaminants, or damage to the reverse osmosis membranes from hydrocarbons. Evaporation processes are the most widespread for brine treatment as they enable the highest degree of concentration, as high as solid salt. They also produce the highest purity effluent, even distillate-quality. Evaporation processes are also more tolerant of organics, hydrocarbons, or hardness salts. However, energy consumption is high and corrosion may be an issue as the prime mover is concentrated salt water. As a result, evaporation systems typically employ titanium or duplex stainless steel materials. Brine management examines the broader context of brine treatment and may include consideration of government policy and regulations, corporate sustainability, environmental impact, recycling, handling and transport, containment, centralized compared to on-site treatment, avoidance and reduction, technologies, and economics. Brine management shares some issues with leachate management and more general waste management. Most solids can be removed using simple sedimentation techniques with the solids recovered as slurry or sludge. Very fine solids and solids with densities close to the density of water pose special problems. In such case filtration or ultrafiltration may be required. Although, flocculation may be used, using alum salts or the addition of polyelectrolytes. Wastewater from industrial food processing often requires on-site treatment before it can be discharged to prevent or reduce sewer surcharge fees. The type of industry and specific operational practices determine what types of wastewater is generated and what type of treatment is required. Reducing solids such as waste product, organic materials, and sand is often a goal of industrial wastewater treatment. Some common ways to reduce solids include primary sedimentation (clarification), Dissolved Air Flotation or (DAF), belt filtration (microscreening), and drum screening. The effective removal of oils and grease is dependent on the characteristics of the oil in terms of its suspension state and droplet size, which will in turn affect the choice of separator technology. Oil in industrial waste water may be free light oil, heavy oil, which tends to sink, and emulsified oil, often referred to as soluble oil. Emulsified or soluble oils will typically required "cracking" to free the oil from its emulsion. In most cases this is achieved by lowering the pH of the water matrix. Most separator technologies will have an optimum range of oil droplet sizes that can be effectively treated. Analysing the oily water to determine droplet size can be performed with a video particle analyser. Each separator technology will have its own performance curve outlining optimum performance based on oil droplet size. the most common separators are gravity tanks or pits, API oil-water separators or plate packs, chemical treatment via DAFs, centrifuges, media filters and hydrocyclones. Typically, the oil layer is skimmed off and subsequently re-processed or disposed of, and the bottom sediment layer is removed by a chain and flight scraper (or similar device) and a sludge pump. The water layer is sent to further treatment for additional removal of any residual oil and then to some type of biological treatment unit for removal of undesirable dissolved chemical compounds. Hydrocyclone oil separators operate on the process where wastewater enters the cyclone chamber and is spun under extreme centrifugal forces more than 1000 times the force of gravity. This force causes the water and oil droplets to separate. The separated oil is discharged from one end of the cyclone where treated water is discharged through the opposite end for further treatment, filtration or discharge. Biodegradable organic material of plant or animal origin is usually possible to treat using extended conventional sewage treatment processes such as activated sludge or trickling filter. Problems can arise if the wastewater is excessively diluted with washing water or is highly concentrated such as undiluted blood or milk. The presence of cleaning agents, disinfectants, pesticides, or antibiotics can have detrimental impacts on treatment processes. 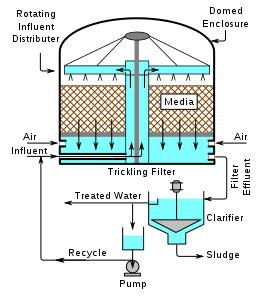 A generalized diagram of an activated sludge process. A settling tank (usually referred to as a clarifier or "settler") to allow the waste sludge to settle. Part of the waste sludge is recycled to the aeration tank and the remaining waste sludge is removed for further treatment and ultimate disposal. A trickling filter consists of a bed of rocks, gravel, slag, peat moss, or plastic media over which wastewater flows downward and contacts a layer (or film) of microbial slime covering the bed media. Aerobic conditions are maintained by forced air flowing through the bed or by natural convection of air. The process involves adsorption of organic compounds in the wastewater by the microbial slime layer, diffusion of air into the slime layer to provide the oxygen required for the biochemical oxidation of the organic compounds. The end products include carbon dioxide gas, water and other products of the oxidation. As the slime layer thickens, it becomes difficult for the air to penetrate the layer and an inner anaerobic layer is formed. A bed of filter medium upon which a layer of microbial slime is promoted and developed. An enclosure or a container which houses the bed of filter medium. A system for distributing the flow of wastewater over the filter medium. A system for removing and disposing of any sludge from the treated effluent. The treatment of sewage or other wastewater with trickling filters is among the oldest and most well characterized treatment technologies. A trickling filter is also often called a trickle filter, trickling biofilter, biofilter, biological filter or biological trickling filter. Synthetic organic materials including solvents, paints, pharmaceuticals, pesticides, products from coke production and so forth can be very difficult to treat. Treatment methods are often specific to the material being treated. Methods include advanced oxidation processing, distillation, adsorption, ozonation, vitrification, incineration, chemical immobilisation or landfill disposal. Some materials such as some detergents may be capable of biological degradation and in such cases, a modified form of wastewater treatment can be used. Acids and alkalis can usually be neutralised under controlled conditions. Neutralisation frequently produces a precipitate that will require treatment as a solid residue that may also be toxic. In some cases, gases may be evolved requiring treatment for the gas stream. Some other forms of treatment are usually required following neutralisation. Waste streams rich in hardness ions as from de-ionisation processes can readily lose the hardness ions in a buildup of precipitated calcium and magnesium salts. This precipitation process can cause severe furring of pipes and can, in extreme cases, cause the blockage of disposal pipes. A 1-metre diameter industrial marine discharge pipe serving a major chemicals complex was blocked by such salts in the 1970s. Treatment is by concentration of de-ionisation waste waters and disposal to landfill or by careful pH management of the released wastewater. Toxic materials including many organic materials, metals (such as zinc, silver, cadmium, thallium, etc.) acids, alkalis, non-metallic elements (such as arsenic or selenium) are generally resistant to biological processes unless very dilute. Metals can often be precipitated out by changing the pH or by treatment with other chemicals. Many, however, are resistant to treatment or mitigation and may require concentration followed by landfilling or recycling. Dissolved organics can be incinerated within the wastewater by the advanced oxidation process. Molecular encapsulation is a technology that has the potential to provide a system for the recyclable removal of lead and other ions from polluted sources. Nano-, micro- and milli- capsules, with sizes in the ranges 10 nm-1μm,1μm-1mm and >1mm, respectively, are particles that have an active reagent (core) surrounded by a carrier (shell).There are three types of capsule under investigation: alginate-based capsules, carbon nanotubes, polymer swelling capsules. These capsules provide a possible means for the remediation of contaminated water. ^ "Battery Manufacturing Effluent Guidelines". Washington, D.C.: U.S. Environmental Protection Agency (EPA). 2017-06-12. ^ Development Document for Effluent Limitations Guidelines, New Source Performance Standards and Pretreatment Standards for the Organic Chemicals, Plastics And Synthetic Fibers Point Source Category; Volume I (Report). EPA. October 1987. EPA 440/1-87/009. ^ a b "Effluent Limitations Guidelines and Standards for the Steam Electric Power Generating Point Source Category". EPA. 2015-09-30. ^ European Environment Agency. Copenhagen, Denmark. "Indicator: Biochemical oxygen demand in rivers (2001)." ^ "7. Wastewater Characterization". Development Document for Final Effluent Limitations Guidelines and Standards for the Iron and Steel Manufacturing Point Source Category (Report). EPA. 2002. pp. 7–1ff. EPA 821-R-02-004. ^ Development Document for Effluent Limitations Guidelines and Standards for the Mineral Mining and Processing Category (Report). EPA. July 1979. EPA 440/1-76/059b. ^ Development Document for the Coal Mining Category (Report). EPA. September 1982. EPA 440/1-82/057. ^ a b Development Document for Final Effluent Limitations Guidelines and New Source Performance Standards for the Ore Mining and Dressing Point Source Category (Report). EPA. November 1982. EPA 440/1-82/061. ^ Guide for the Application of Effluent Limitations Guidelines for the Petroleum Refining Industry (Report). EPA. June 1985. p. 5. ^ Permit Guidance Document: Pulp, Paper and Paperboard Manufacturing Point Source Category (Report). EPA. 2000. pp. 4–1ff. EPA-821-B-00-003. ^ "Timber Products Processing Effluent Guidelines". EPA. 2018-03-13. ^ a b c d Beychok, Milton R. (1967). Aqueous Wastes from Petroleum and Petrochemical Plants (1st ed.). John Wiley & Sons. LCCN 67019834. ^ Hobson, Tom (May 2004). "The Scoop on Oil Skimmers". Environmental Protection (formerly Water and Wastewater News). Dallas, TX: 1105 Media, Inc.
^ American Petroleum Institute (API) (February 1990). Management of Water Discharges: Design and Operations of Oil-Water Separators (1st ed.). American Petroleum Institute. ^ a b Beychok, Milton R. (December 1971). "Wastewater treatment". Hydrocarbon Processing: 109–112. ISSN 0887-0284. ^ Tylkowski, Bartosz; Jastrząb, Renata (2017). "Chapter 4. Smart Capsules for Lead Removal from Industrial Wastewater". In Astrid, S.; Helmut, S.; Sigel, R. K. O. Lead: Its Effects on Environment and Health. Metal Ions in Life Sciences. 17. de Gruyter. pp. 61–78. doi:10.1515/9783110434330-004.